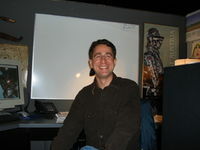 Kurt Kuhlmann started at Bethesda in 1996. He left following the release of Redguard but was persuaded to come back by Todd Howard and is now a senior designer. He released a "Real Carriages" mod for Skyrim, utilizing content that didn't ship in the final game. This page was last modified on 3 November 2018, at 08:16.